Former Maharashtra chief minister Narayan Rane on Thursday said he had quit the Congress, amid speculation that he was veering towards an innings in the Bharatiya Janata Party. Announcing his decision in his home turf Sindhudurg district in coastal Konkan region, Rane accused the Congress of reneging on the promise of making him the state's chief minister when he joined the party 12 years ago after leaving the Shiv Sena. "I sent my resignation letter to Sonia Gandhi today," Rane said. "In the letter, I thanked them and haven't criticised either Sonia or Rahul Gandhi," he added. The Maratha leader, who was the chief minister in 1999 while in the Shiv Sena, told a press meet in Kudal that he had also resigned as a member of the legislative council. Rane said he was yet to decided on his next move. "I have not yet decided where to go," he said, referring to speculation about his joining the BJP, and added that he would make an announcement on this before Dussehra, which falls on September 30. The former firebrand leader of the Shiv Sena joined the Congress on July 26, 2005, and was the next day made revenue minister in the then Congress-led government in the state. "(Congress leader) Ahmed Patel had told me after I joined the party that I would be made the chief minister," Rane said. The conjecture about Rane joining the BJP was triggered by reports suggesting he had met BJP president Amit Shah in Ahmedabad a few months ago. During the recent Ganesh festival, Chief Minister Devendra Fadnavis had visited Rane's residence, further fuelling the speculation. Rane said Nilesh Rane, his son and former Congress MP, had also resigned from the party. His other son Nitesh, a Congress MLA, had not quit yet, Rane said. "But he will quit later, along with many Congress and Shiv Sena legislators," he added. Mounting an attack on Maharashtra Pradesh Congress Committee president Ashok Chavan, Rane said he did not have "any qualification" to hold that post. "After the 26/11 Mumbai terror attacks, when the Congress was considering a replacement for Vilasrao Deshmukh, 48 legislators backed me and only 32 supported Chavan but I was overlooked and he was made the chief minister," Rane said. He added that while Rahul Gandhi had made him an MLC, Chavan was "camping in Delhi to ensure I didn't become one". Meanwhile, Ashok Chavan said that the reasons cited by Rane for leaving the party were "devoid of facts". "I came to know through television channels that Rane has decided to leave the party and resign from party posts. Whatever reasons he gave are devoid of facts. I wish him luck for his future assignments. I will put forth the facts in due course," Chavan said. All India Congress Committee chief spokesperson Randeep Singh Surjewala said in Delhi that the former Maharashtra chief minister's move was "intriguing" as it came a day after what he called levelling of allegations against Rane by a BJP leader over his alleged connections with Dawood Ibrahim. Reacting to the development, Shiv Sena spokesperson Neelam Gorhe dismissed Rane's earlier claim that her party had invited him to return to its fold. "I do not have any clue if any offer was made at all. But it is improbable that someone approached him and he declined," Gorhe said. "From what I know about how our party functions, any person in Sena will not do anything without a green signal from (party chief) Uddhav Thackeray," she said. Despite the late Sena patriarch Bal Thackeray making him chief minister, Rane forgot history and continues to criticise Uddhav Thackeray, she said. "People are not happy with the organisation. The Congress is on the verge of destruction. If senior leaders are quitting the party for not being treated properly, the party needs to introspect," said Atul Shah, state BJP spokesperson. Nationalist Congress Party spokesperson Nawab Malik, on the other hand, hit out at Rane, calling him hungry for power. "The Congress gave him a ministerial berth and made him a member of Legislative Council. When his party is out of power, this greedy man, who cannot live without power, is knocking on BJP's doors. The question is whether the BJP will accept him or will he become another Shankersinh Vaghela," Malik said. Rane, who has pockets of influence in the Konkan region of Maharashtra, was expelled from the Sena by then supremo Bal Thackeray after he voiced displeasure over the latter's son Uddhav gaining prominence in the party. 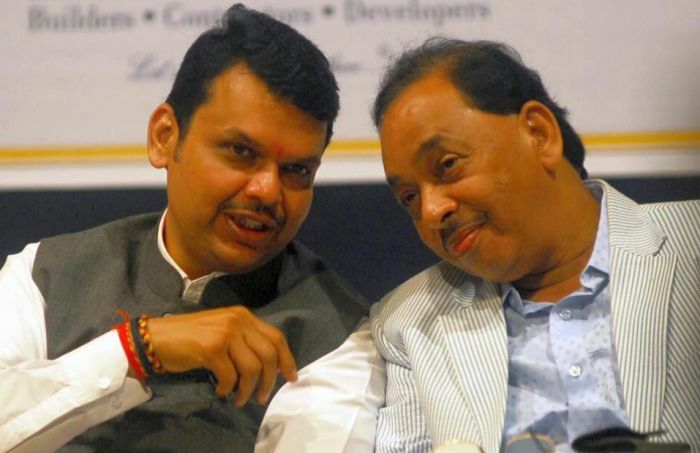 A tough talking leader, Rane, who was handpicked by Thackeray as chief minister when he decided to remove Manohar Joshi ahead of the 1999 assembly polls, had recently claimed he had received an offer from the Sena to return to its fold. He, however, did not say if he was offered any post. "It's not about any post. I said I don't want to rejoin the Sena. If the Sena doesn't want me, why would the offer have been made," Rane had said. The recent threat by the Sena to pull out of the BJP-led coalition government is being seen as an attempt to thwart Rane's entry into the BJP. On the Sena's threat to withdraw from the government in Maharashtra, Rane had said, "This is the old style of Sena president Uddhav Thackeray". Rane had said the Sena often enacted the "drama" of threatening to quit the government while enjoying the privileges of power. At a recent rally in Kudal, Rane had blasted the Congress for what he described as the injustice it had done to him and said his supporters would contest the upcoming panchayat polls under a new entity --Samarth Vikas Panel.